Yanolja, a leading Seoul-based leisure company, has invested $15 million into Southeast Asia’s leading economy hotel chain ZEN Rooms, with rights to acquire 100% of the company in the future. This is the biggest startup investment by a South Korean’s company in the region. 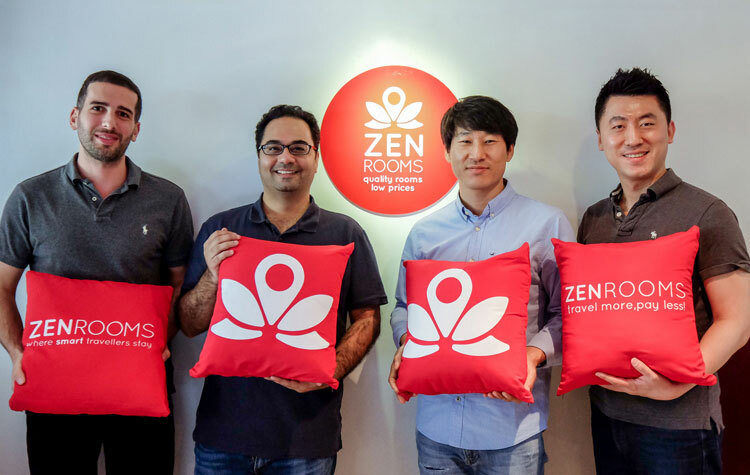 ZEN Rooms, founded in 2015 by ex-Foodpanda co-founder Kiren Tanna and Nathan Boublil, operates a disruptive economy hotel chain and online booking platform in Malaysia, Indonesia, the Philippines, Thailand, and Singapore. Within only three years, ZEN Rooms’ business has grown exponentially to over 1,000 economy hotel franchisees and over 7,000 room inventory. It has established itself as the top-rated affordable franchise in the region, with average customer review scores of 7.9 on public OTA and review sites. ZEN Rooms was founded to disrupt the value-for-money of the Southeast Asian hotel market, helping hotel franchisees be more efficient, competitive, safe and reliable by strengthening their quality standards, resulting in improved customer satisfaction for budget travelers. ZEN Rooms is vertically integrated, combining room booking, branding, sales and management with a self-developed online and mobile platform, which distinguishes ZEN Rooms from other hotel franchises. ZEN Rooms now plans to use the capital to expand its inventory base in current and new markets and to continue investing in technology to improve the sector’s efficiency. The Southeast Asian travel market today is the fastest growing worldwide, undergoing a rapid and continuous surge in both domestic and international economy travel demand, similar to China 15 years ago and Korea 5 years ago. Furthermore, Southeast Asia is a favorite tourist destination for Korean travelers, and 17% of foreign travelers to Korea come from Southeast Asia. Thus, ZEN Rooms’ reputation and growth in Southeast Asia and the established leisure platform of Yanolja make the combination a leading force in the South East Asian travel market. “ZEN Rooms’ mission is to provide quality economy accommodation to travelers across Southeast Asia and help our hotel partners maximize their business potential. South East Asia is still at the beginning of both the hotel franchising revolution and its travel demand surge – and we are delighted to join forces with Yanolja to fulfill this mission. Through its leadership in the Korean market, Yanolja has unparalleled hospitality knowledge and has built a highly refined and innovative business model and best-in-class platform that we are looking forward to bringing to the Southeast Asian market,” says Kiren Tanna, co-founder of ZEN Rooms. Yanolja, Inc. is a leading “O2O” (Online-to-Offline) accommodation platform company in South Korea. It leads the industry in many aspects, including revenue growth, boasts more than 9 million online members, and has more than 41,000 listings on its travel and stay database. Yanolja has been playing a leading role in the Korean “space-rental” business, providing travelers with real-time travel-and-stay booking services to a comprehensive database of hotels, motels, private lodgings, guesthouse and international destinations. It is also the first travel-and-stay business in South Korea with more than 120 franchise hotels. ZEN Rooms is Asia’s fastest growing hospitality company. By helping its franchisees run more efficiently, ZEN Rooms is able to provide the most reliable economy accommodation in Southeast Asia. It is now the top-rated hotel chain in the region on Booking.com and operates more than 6,000 rooms across 50 cities in 7 countries. ZEN Rooms offers travelers quality and affordable room stays in Southeast Asia’s top destinations and provides all the key essentials needed for a comfortable stay with unbeatable rates (starting at only $10). Every ZEN guest is guaranteed cleanliness, free fast Wi-Fi, comfortable double bed, working AC, a hot shower and 24/7 customer support. In Q4 2017, ZEN became the highest-rated economy chain (8.0/10 in Booking.com), and achieved a top 3 hospitality franchise ranking in the Philippines, Indonesia, Malaysia and Singapore. ZEN Rooms is now the fastest-growing company backed by the German conglomerate Rocket Internet, the company behind Lazada, Zalora and Foodpanda. The company has allowed hundreds of thousands of travelers to explore Southeast Asia safely and affordably. To learn more about ZEN Rooms, visit www.zenrooms.com.